Thought Leaders CEO Peter Cook has a wealth of experience when it comes to leveraging your expertise for maximum impact. Peter is a best- selling author with eight books to his name. These include, Implement!, Sell your Thoughts and E-Myth Bookkeeper which he co-authored with Michael Gerber. With over 15 years experience as a consultant to some of the largest companies in the world, Peter is well equipped to help thought leaders, business leaders and every day people achieve business and financial mastery. In his home life, Pete is happily married to his gorgeous wife Trish, and father to two amazing daughters, Scarlett and Amelie. He is halfway through a six-month course in Spain to be a meditation teacher and recently took his vows as an Ishaya monk. He also has a third dan black belt in Aikido, so don’t mess with him! A bright but admittedly somewhat disinterested student at university, Peter started life as a Consultant at Accenture. After gaining a foundation there, he found himself horrified by the idea of putting in the time and sacrifice to become a partner. At 27, he quit to become a business coach. A tough journey in the initial stages, he gradually gained experience and exposure and built enough momentum to gather a client and coach base. However, it took a nine day holiday to Bali - all he could afford without the ‘wheels falling off’ - to realise he wasn’t living the life he set out to establish. He let go of his coaches, dramatically cut down his clients and learnt to manage his business offline to be able to go back to Bali for two months. A friend advised him to see Matt Church, who was (and still is) the Founder and Chairman at Thought Leaders. From their very first conversation, Peter became engulfed in the dynamic community of original thinkers and thought leaders. In Peter’s mind, thought leadership is about original thinking and how to devise, sell, deliver and integrate that thinking. He helps clever people be commercially smart. Specifically, this is in relation to understanding the domains of their expertise, how to develop and deliver knowledge and which market clusters to target with their pitch. Peter describes The Thought Leaders Business School, which is a group of extraordinary people who’ve adopted a similar mindset, habits and actions to leverage off their unique knowledge proposition and deliver it to the market. They define success in the thought leadership game to be of three facets: revenue, lifestyle and legacy. Peter feels it is critical to be confident and comfortable in what you think, rather than what others do. He believes in managing and manipulating the way you want your life to look in order to lead a life by design, not a life by default. Peter constantly ‘hacks’ himself. He understands what works and what doesn’t work for him, and finds ways to continually improve. For instance, different environments to ‘hack’ productivity, different routines to ‘hack’ thinking patterns and different mindsets to ‘hack’ schedule constraints. 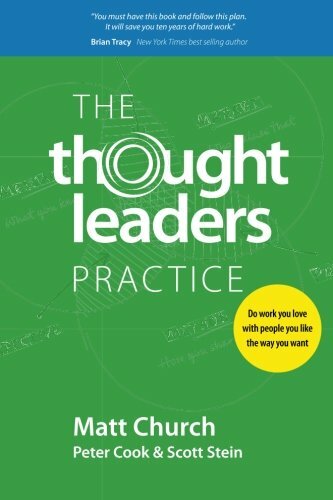 The Thought Leaders Practice by Matt Church, Scott Stein and Peter Cook himself. Otherwise feel free to reach out to him on LinkedIn (https://au.linkedin.com/in/cookpete) to discuss anything thought leadership or otherwise.